Pictured are: Legislator Becker and Sgt. Robert Fecanin, 2nd Battalion 25th Marines. 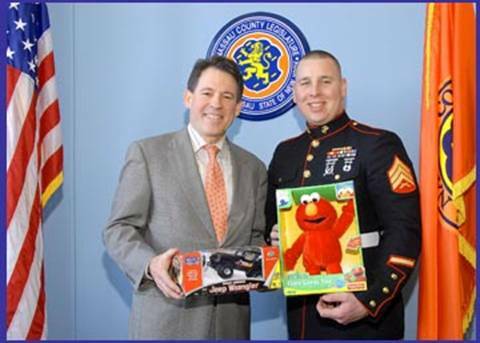 Nassau County Legislator Francis X. Becker, Jr., joined with the United Stated Marine Corps 2nd Battalion to make his annual toy donation to the Marine Toys for Tots Program. Under the direction of Major Chuck Kilbride, this year marks the 60th year that the Toys for Tots Program has collected and distributed toys to needy children nationwide. In 2006, the Marines and volunteers distributed over 19.2 million toys to 7.6 million needy children. “It’s amazing to watch a how a toy can bring a smile to a young child’s face. Toys for Tots makes Christmas special for so many disadvantaged youngsters across the country. It is a very worthy cause and I encourage all to make a donation,” said Legislator Becker. Please visit www.toysfortots.org to find a donation location near you, or feel free to drop off a toy to Legislator Becker’s office and he will make sure that it is donated for you.